High-Dose Verapamil in Episodic and Chronic Cluster Headaches and Cardiac Adverse Events: Is It as Safe as We Think? 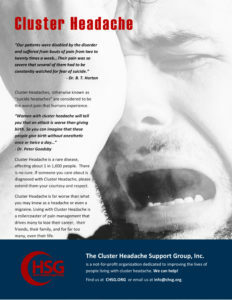 Cluster headache (CH) is a primary headache disorder with relatively effective treatments. Although few sufficiently controlled trials are available, verapamil is recommended as the first-line prophylactic drug for CH by the French Headache Society (with a low level of evidence, level B) and by the EFNS (European Federation of Neurological Societies, level A). Daily doses of more than 480 mg (and up to 1200 mg daily) are frequently used off-label, while 360 mg daily is the only dosage to have demonstrated its effectiveness in a double-blind trial against placebo, and the usual label posology used by cardiologists is 240 mg daily in hypertension. Cluster headache is characterized by unilateral attacks of severe pain accompanied by cranial autonomic features. Hallucinogens are as old as civilization. Many cultures recorded eating certain plants specifically to induce visions or alter the perception of reality. Often these hallucinations were part of a religious or prophetic experience. Shamans in Siberia were known to eat the hallucinogenic mushroom Amanita muscaria . The ancient Greeks and the Vikings also used naturally occurring plant hallucinogens. Peyote, a spineless cactus native to the southwestern United States and Mexico was used by native peoples, including the Aztecs, to produce visions.